To compile a metadata overview of existing data and review the literature at on hydromorphology-ecology interactions different scale levels (spatial and temporal) and underlying hydromorphological and ecological variables and processes across Europe. 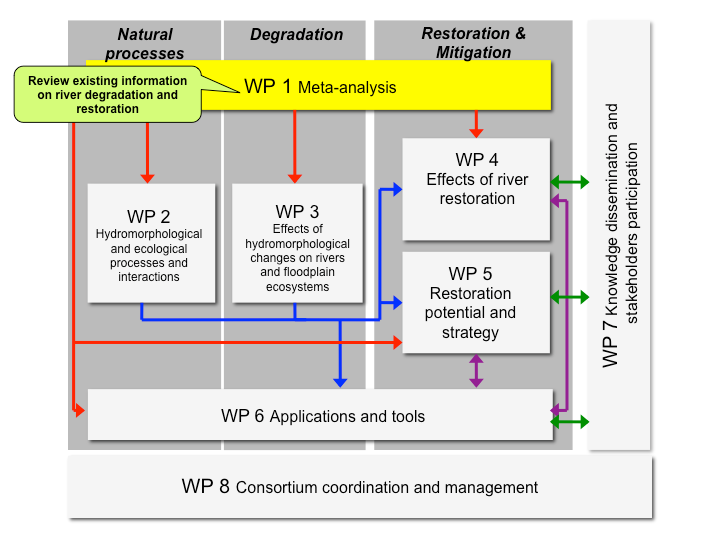 To compile a metadata overview of existing data and review literature on the man-made physical and socio-economic impact of hydromorphological and ecological degradation (including the first European RBMPs, to identify knowledge gaps) and restoration dynamics, at relevant spatial and temporal scales. To perform meta-analyses on biotic responses to hydromorphological restoration at different temporal and spatial scales, and on the effects of multiple pressures interfering with restoration effects. To support tasks in WPs 2-5 by providing task databases.